Jagdgeschwader 300 (JG300) was a Luftwaffe fighter-wing of World War II. 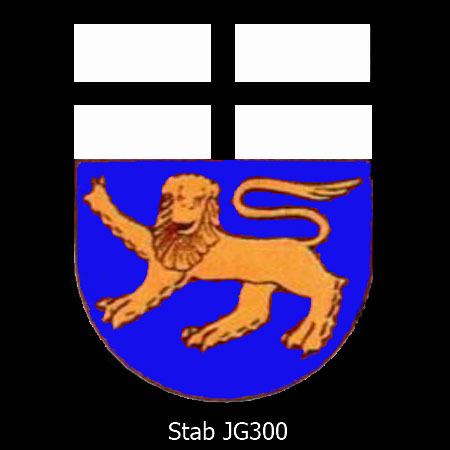 JG300 was formed on June 26, 1943 in Deelen as Stab/Versuchskommando Herrmann, from July 18, 1943 as Stab/JGHerrmann, and then finally redesignated on August 20, 1943 to Stab/JG300. Its first Geschwaderkommodore was Oberstleutnant Hajo Herrmann. JG300 had its origins in April 1943, when Major 'Hajo' Herrmann, a decorated bomber pilot advocated the use of single-seat day fighters in a night fighting role to combat the RAF's escalating Night Bomber Offensive. He suggested that single seat fighters could operate in the bombers' general target area using the light of target indicators, massed searchlights and the fires on the ground to spot their targets. These operations were trialed over Berlin during May and June 1943 and codenamed 'Wilde Sau'. Recruiting a group of experienced bomber pilots and former instructors with the requisite blind-flying experience, a test unit was set up on June 26, 1943 in Deelen as Stab/Versuchskommando Herrmann to test Herrmann's theory. Standard Fw 190-A's and Bf 109-G's were used, initially 'borrowed' from their parent day units, one of which was Jagdgeschwader 11. Jagdgeschwader 300 employed the Wilde Sau tactic in single engine fighters for the first time on the night of 3/4 July 1943 when 653 RAF aircraft attacked Cologne's industrial area on the east bank of the Rhine. The German fighters, taking advantage of the illumination from searchlights, target indicator flares and ground fires claimed 12 aircraft shot down, but had to share their claims with the anti-aircraft batteries who also claimed the downings. To avoid losses to friendly fire, anti-aircraft batteries were orderd to restrict the height of their flak barrage and the fighters operated above that pre-agreed ceiling. The test unit expanded into JG300, its I. Gruppe officially formed on August 20, 1943. 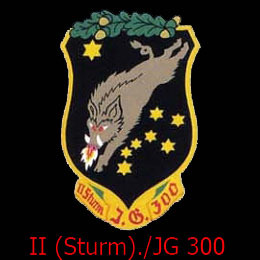 Sister units JG301 and JG302 were also formed on similar lines at this time, collectively brought together as 30 Jagd Division under Herrmann's command. Special variants of the Bf 109 were later adapted for this night fighter duty; the Bf 109 G-6(N) and Bf 109 G-6(Y). The former was fitted with the FuG 350 'Naxos Z' passive homing detector and the latter with the 'Y' interception radio system. Initially however these single seat fighters used no radar or radio aids whatsoever. 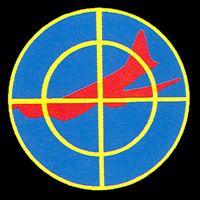 Although 30 Jagd Division was initially far from a fully established Jagdgeschwader the formation process was rapidly speeded up with RAF Bomber Command deployment in July 1943 of 'Window'; radar-jamming tin-foil strips which had rendered the Luftwaffe radar control system ineffective. JG 300 and its sister units were the only real interim counter measure while Luftwaffe radar research technology strove to overcome this jamming. JG300's night operations met with considerable success initially, with 56 bombers claimed shot down on the night of 24 August, 47 claimed 1 September, and another 26 on 4 September. However, the number of night accidents involving single-seat fighters caused by poor weather conditions in the winter of 1943 led to unsustainable losses in pilots and aircraft. Thus by the end of 1943 JG300 fielded 3 Fw 190 A-6 (Stab), 14 Bf 109 G-6 (I Gruppe), 4 Fw 190 A-6 (II gruppe) and 1 Bf 109 G-6 (III gruppe). By early 1944 the Nachtjagdgeschwaders has been equipped with the advanced and 'window-proof' Lichtenstein SN-2 VHF airborne radar, and thus JG300 gradually evolved into a standard day fighter unit, flying operations against the USAAF 8th and 15th Air Forces over Western Europe as a part of Reichsverteidigung (Defense of the Reich). Night operations were still sometimes flown, as on the 24/25 March 1944, when I. and II./JG300 claimed 7 RAF bombers of one loss. By this time Oblt. Klaus Bretschneider of 5./JG 300 had, as a "Wilde Sau" night fighter, claimed 14 night victories during 20 combats. By May 1944, JG300 at last had numbers approaching a full establishment of aircraft, with I./JG300 having 42 (14 operative) Bf 109 G-6 at Bonn Hangelar; II./JG300 stationed at Dortmund with 25 (13) Fw 190 A-6 and III./ JG300 with 46 (25 operative) Bf 109 G-6 at Wiesbaden/Erbenheim. 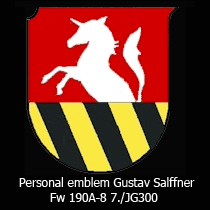 Major Walther Dahl was appointed Kommodore of JG300 on 27 June. JG300 lost several of its top aces in the summer of 1944. On 28 July 1944, Oblt. Ernst-Erich Hirschfeld (24 claims, 9 at night) of 5. JG 300 was shot down and killed in his Fw 190 A-8 near Erfurt, as was Leut. Gerhard Barsdorf (7 claims) who collided with his wing man. On 29 July 1944, Oberfeldwebel Hermann Wischnewski (26 claims) of I./JG300 shot down two B-17 bombers and a P-51 fighter but then shot down himself and badly injured. In the summer of 1944 Strumgruppen units were raised, comprising modified heavily armoured and armed FW 190 fighters, and charged with breaking up the massed ranks of USAAF daylight bombers. Initially manned by volunteers, each pilot was trained to close with the enemy and engage in extremely short-range combat, attacking from the front and the rear in tight arrowhead formations, even to contemplate deliberately ramming enemy bombers when circumstances permitted. II./ JG300 became such a 'Strumgruppen unit at this time and, equipped with the Focke-Wulf 190 A-8/R2 or R8 with two 30mm cannon Mk 108 and two 20mm cannon MG 151/20, enjoyed initial success in downing bombers, but also suffered heavy losses to the massed fighter escorts. From June 1944 until the end of October 1944 II gruppe suffered some 73 killed, 2 missing, and 32 wounded. Major Alfred Lindenberger, (a forty-seven year old Prussian World War I ace with 12 victories) was posted to II./JG300 in June 1944 and was made Gruppenkommandeur later in 1944. On 28 September 1944 he was shot down by P-51s and wounded. Owing to his age and inexperience with modern fighters he flew most sorties as a wingman. Lindenberger claimed two US 'Viermots' on 17 December 1944. As the year progressed the 30 Jagddivision was broken up, as JG301 left for Ploesti in Romania while JG302 flew combat over Hungary and Austria. Only JG300 remained in the Reich. Major Dahl was dismissed from his command of JG300 by Hermann Göring on 30 November 1944 for refusal to launch what he considered a suicidal interception mission. During the Ardennes offensive in late 1944 JG300 was one of the few units remaining on Reich defence duties with most other fighter units sent to support attacking ground forces. The Geschwader took heavy losses in late 1944, particularly on 17 December when 100 aircraft of JG300 intercepted USAAF bombers, claiming 33 shot down but losing 43 of their own number. Many of the pilots killed were irreplaceable Experten, including on 24 December 1944, JG 300's top scorer Oblt Klaus Bretschneider (34 victories, including 17 US bombers) who was killed attacking four-engined bombers over Kassel. Formed 26 Jun 1943 in Deelen as Stab/Versuchskommando Hermann, from 18 Jul 1943 as Stab/JG Hermann, and then finally 20 Aug 1943 as Stab/JG300. Ordered disbanded 19 Mar 1945, but remained at least until late April 1945. * detachments at Juterbog, 18 Feb 1944 - 21 Feb 1944; at Rheine, 1Mar 194 - 25 Apr 1944; at Seyring, 13 May 1944 - 10 Jun 1944. Was being reorganised as JGr.300, together with III./JG300 in May 1945. 12./JG300 was disbanded Dec 1944. Was being reorganised as JGr.300, together with II./JG300, in May 1945. * detachments at Juterbog, Sep 1944; at Biblis, Oct 1944; at Darmstadt, Oct 1944. Formed Aug 1943 in Germany. Disbanded Aug 1944. Possibly based at Bonn-Hangelar.